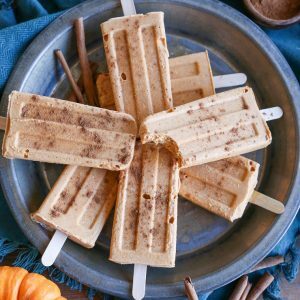 Creamy, dreamy pumpkin spice popsicles made with coconut milk ice cream, pumpkin puree, and pumpkin pie spice. This easy 3-ingredient recipe is dairy-free, refined sugar-free, vegan, and paleo. This post is sponsored by Coconut Bliss. A number of years ago, one of my girlfriends and I drove to Healdsburg, CA for a half marathon on Halloween weekend. Along the way, we stopped at a farm stand that was selling pumpkin ice cream, which we relished using plastic spoons during our drive. I’ve never forgotten that pumpkin ice cream! It hasn’t been until now that I’ve revisited the topic. Popsicle-style! When we think pumpkin, we typically imagine a warm, straight-from-the-oven baked good, but for me, pumpkin season isn’t reserved for hot recipes only. In fact, I use pumpkin in smoothies regularly, absolutely adore a chilled vegan pumpkin cheesecake, and as you see in this post, a pumpkin ice cream treat is a-okay by me! 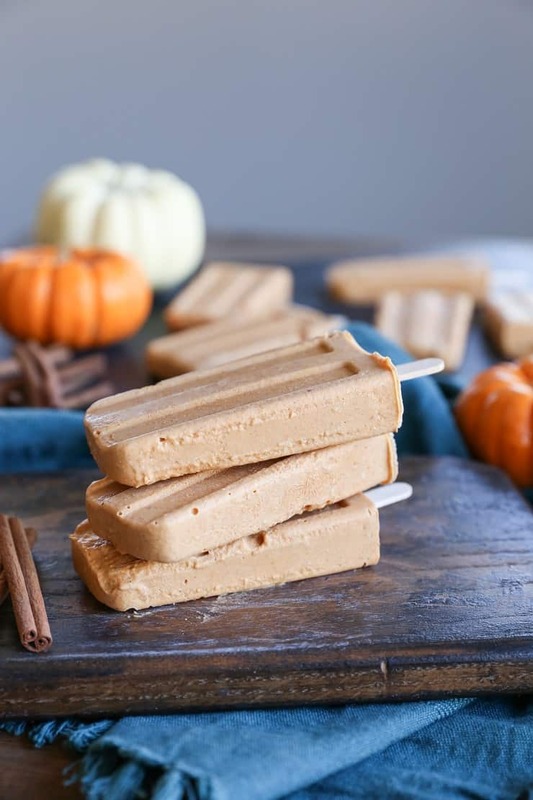 This easy recipe for pumpkin spice popsicles only requires three basic ingredients: Coconut Bliss Naked Coconut Ice Cream (which is dairy-free and naturally sweetened, hazaaaah! ), pumpkin puree, and pumpkin pie spice. All we do is blend the ingredients until combined using a blender, transfer the mixture to popsicle molds, then freeze for a few hours until they’ve set up. Talk about a low-maintenance approach to pumpkin! I have a backstory for you regarding Coconut Bliss Ice Cream. I discovered the ice cream at Whole Foods five years ago when I was deep in the throes of my paleo days. It was the only ice cream that was both dairy-free (made with coconut milk) and naturally sweetened (with agave). 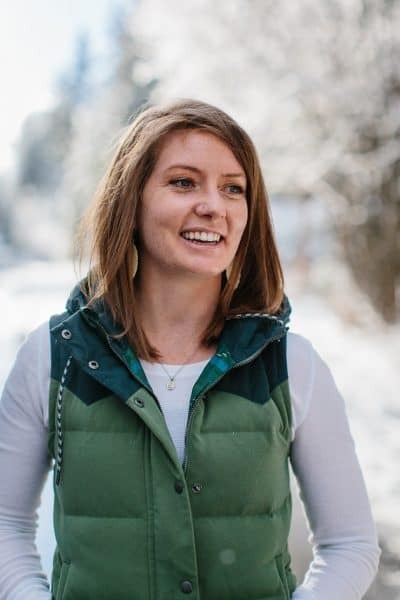 I took to Coconut Bliss’s ice creams like white on rice, and have loved seeing the release of new flavors over the years – I’ve tried almost all of them! One of my favorite aspects of the ice cream other than the fact that it makes me feel awesome (regular ice cream and I have a torrid relationship), is it isn’t overly sweet. For me, the level of sweetness is pure perfection. But don’t take my word for it, women across America agree with me. 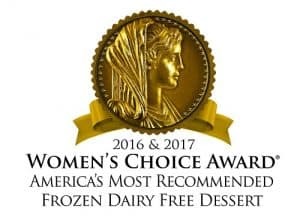 Coconut Bliss has earned the Women’s Choice Award as America’s Most Recommended Dairy Free Frozen Dessert 2 years in a row over all other brands! The way I see it, these popsicles are great during the fall months while it’s still warm outside. We can still enjoy that creamy, pumpkin spice flavor while cooling off and not needing to turn on the oven. On the flip side, if you’re like me, you’ll 200% eat these popsicles on the couch while engulfed in a down blanket with your fuzzy socks while it’s chilly out. Because my love for all things ice cream, coconut, and pumpkin knows no bounds. Looking for a delicious yet healthier treat to give to children? This is mega! Regarding the flavor of Coconut Bliss in this recipe – As I mentioned, I went with the Naked Coconut flavor, which contains nice little bits of real coconut for a fun texture. You can also use Vanilla Island or Ginger Cookie Caramel to change up the ice cream selection. Option to make these popsicles sweeter? Add 1 to 2 tablespoons of pure maple syrup. 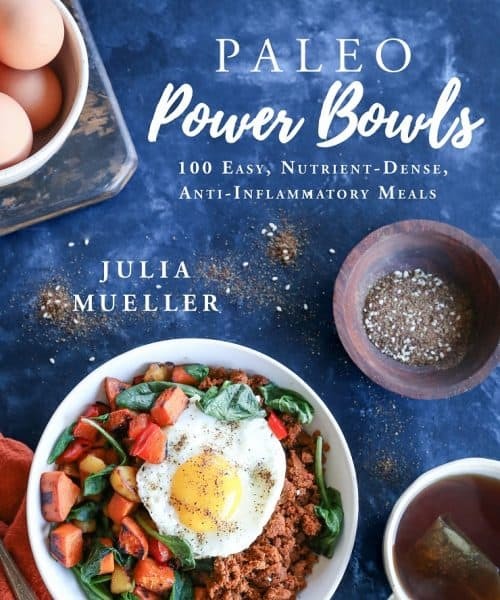 The recipe as written yields what I consider to be a perfectly sweet treat, although I get that some people like their desserts much sweeter than I do. If this sounds like you, consider adding pure maple syrup or honey to taste. You can also get crafty and drizzle these popsicles with Chai-Spiced Paleo Salted Caramel or Paleo Chocolate Magic Shell for a boost of flavor. And that’s it! 3 ingredients, a blender, and the patience to allow these beauties to freeze is all you need! 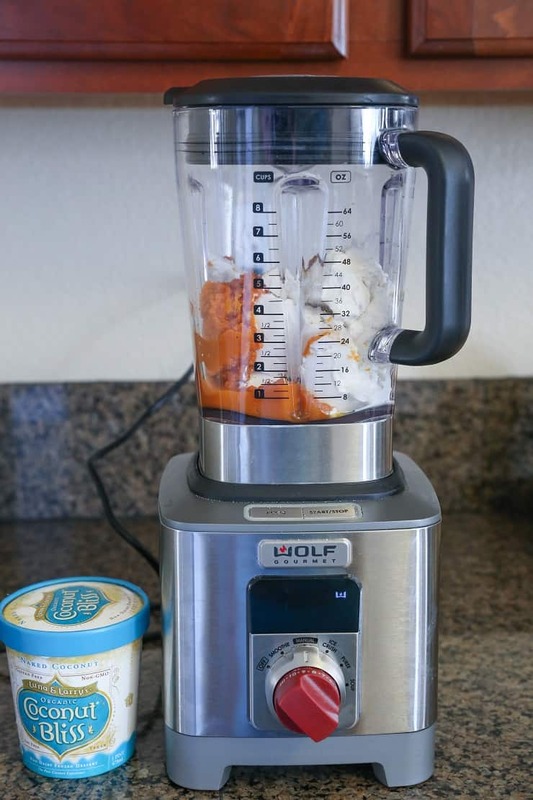 Add the ingredients for the pumpkin spice popsicles to a blender and blend until completely smooth. Taste mixture for flavor and add 1 to 2 tablespoons pure maple syrup if a sweeter treat is desired. Transfer pumpkin mixture to a popsicle mold. Cover, and insert popsicle sticks. Freeze 2 to 3 hours until set up. Thaw or run hot water over the outside of the popsicle mold for 10 seconds to help release the popsicles. Serve and enjoy! Add 1 to 2 tablespoons pure maple syrup for sweeter popsicles. Coconut Bliss received the Women’s Choice Award for America’s most recommended frozen dairy dessert in 2016 & 2017! What a nice way to make a pumpkin treat. Perfect for a children’s birthday party this weekend! 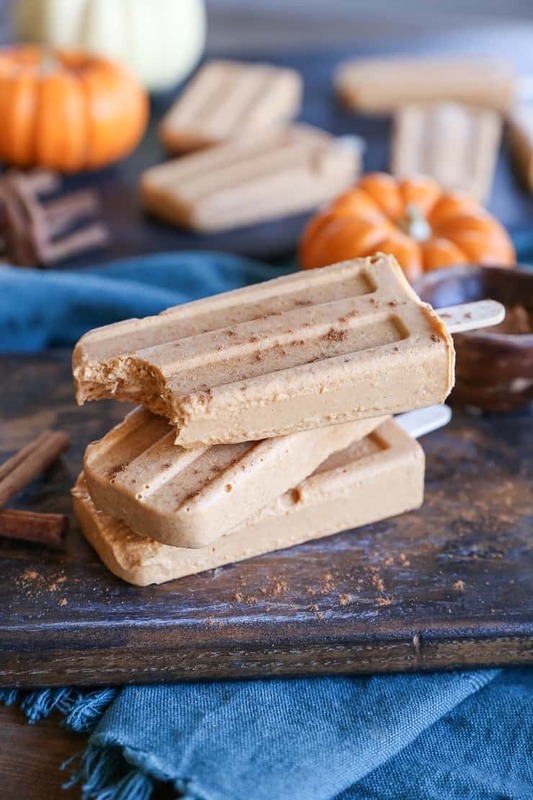 I just love pumpkin ice cream and these pops are a great way to enjoy it — with built-in portion control! 🙂 It’s so blazing hot here too…these are the perfect way to cool off! Oh my word! These are such perfect Fall treats. I’m a big fan of Coconut Bliss ice cream and probably have some in my freezer. I can’t wait to try to making these! 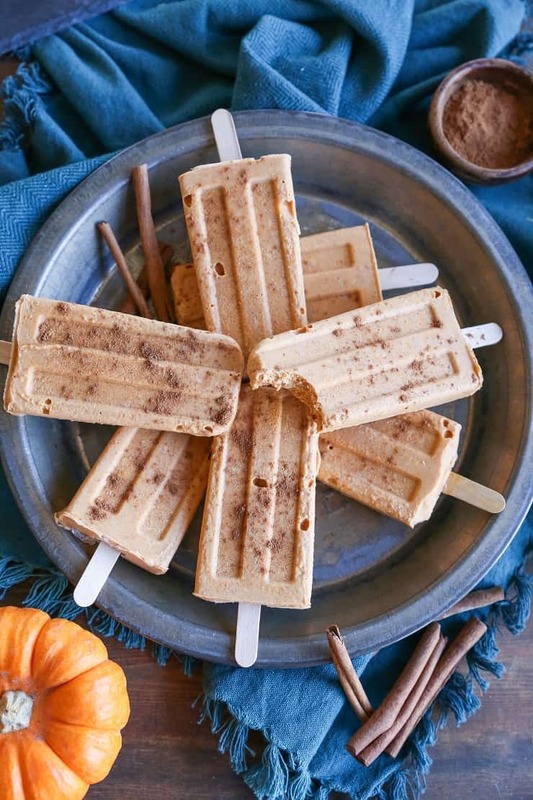 These sound so delicious – what a great way to enjoy popsicles in the fall! You are a genius for coming up with this idea! 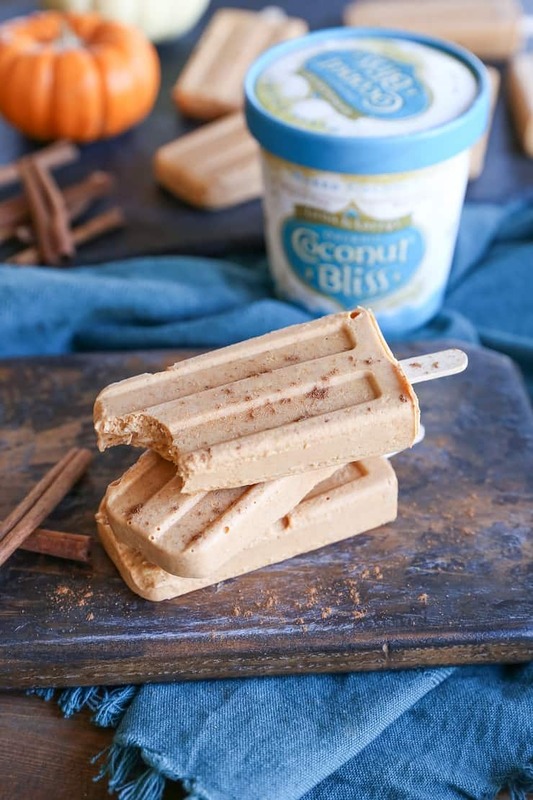 I’ve had the Coconut Bliss and it’s delicious so I know these popsicles are just as dreamy as they look!